The Now Network is apparently voting thumbs-down to the idea of having its Total Equipment Protection plans available to its new crown jewel. 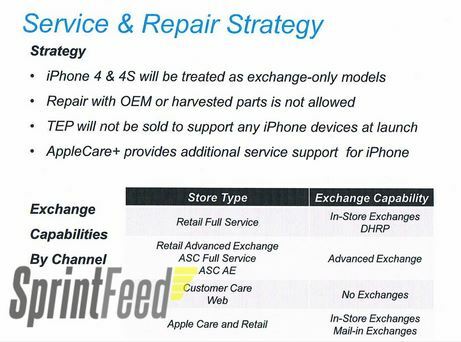 According to a leaked slide courtesy of SprintFeed, your shiny Sprint-branded iPhone 4S (or 4) won't be offered with a healthy portion of peace of mind; rather, you'll need to purchase the AppleCare+ Protection Plan or go through a third party to have any protection from accidental damage. This may change down the road, as the slide says it won't be offered "at launch," but only time will tell. Unfortunate, yes, but we suppose there's always a bright side -- at least there's now a Sprint iPhone to not have insurance for, right? Sprint says no to iPhone insurance, AppleCare+ breathes sigh of relief originally appeared on Engadget on Sun, 09 Oct 2011 18:11:00 EDT. Please see our terms for use of feeds.